Even though the hearty winter season of chili and big beefy stew is upon us, it's nice to have a light dessert to compliment those big meals. Our friend Marianne invited us over for a little football and crockpot stewed ribs (yum! ), I called dessert. While I would normally save these melt in your mouth, sugary wafers of goodness for summer fruits, they can also be a nice compliment to a hearty fall or winter meal. The key is going to be the toppings. Staying in the fruit realm, I choose to create two toppings to give the depth to the dessert - a blueberry port and a bourbon plum sauce. The addition of the alcohol helped to deepen the flavors for a slightly heartier effect without overwhelming. To top it off, I went out on a limb and made a fresh chocolate whipped cream. 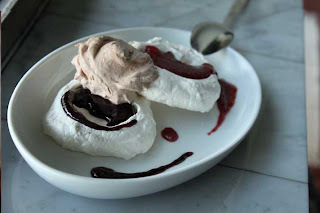 The whipped cream matched wonderfully with the blueberry port, bringing out the deep flavors of the port; I wold probably prefer the the plum sauce with a normal vanilla flavored whipped cream. 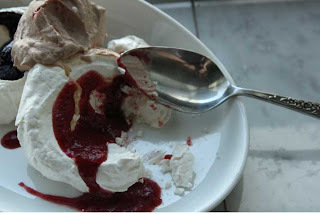 And because of the fruit sauces, I did add a hint of lemon to the meringues, it was a delightful touch. All in all, it was a great night of food, friends and football. 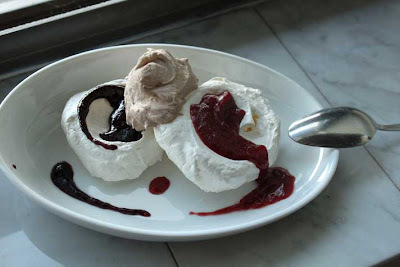 If I had to do it all over again, I would add a spoon of vanilla custard to each meringue for a sturdier dessert (I added a custard recipe that would work great with with this recipe, below). Regarding the fruit sauces - I always say, use whatever you have handy; so if you have raspberries and red wine rather than plums and brandy on hand, just go with it and adjust the flavors to your liking! Heat oven to 200 degrees. In a stand mixer, place 2 egg whites and begin to whip. Add the cream of tarter when the eggs begin to get foamy. When the eggs hit a soft peak, slowly add the sugar and the lemon zest. Continue to mix on high until stiff peaks form, add the vanilla, mix until incorporated. Place parchment paper on a baking sheet. Form the meringues- to do this you can form the bowl of the meringue with the back of a spoon or put the meringue into a decorating bag, use a large open tip to form the base and sides of the bowl. Bake for about 2 hours. Shut off the oven and let sit overnight. Choose your fruit. Simmer a few cups of the chopped fruit with about 1/2 cup sugar (or corn syrup), 1 tbls lemon zest and 1 tsp almond flavor. As the fruit begins to thicken (could take 15-20 minutes), take your immersion blender and blend until smooth. Add in 1/3 cup of your matching liquor and simmer 5 more minutes. Begin by whipping the cream, add the cocoa powder and slowly add the sugar. When the cream becomes nearly whipped, add the vanilla. Whippe until stiff. 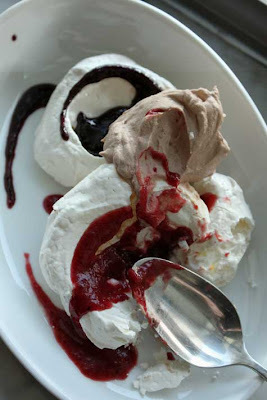 Pour warm fruit sauces on the meringue and top with the whipped cream. If you want to add the custard to this, follow the recipe below, place on meringues before the fruit sauce. Place sugar, flour and salt in a saucepan. Gradually stir in the milk over medium-high heat until mixture boils. Temper the egg with the hot custard, add back to saucepan; cook until it bubbles again. Remove from heat and stir in the butter and vanilla. Cool slightly.